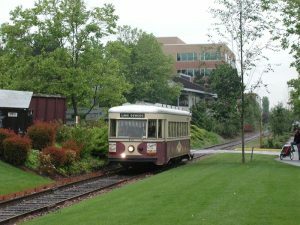 As built, car # 813 was used on the city streetcar lines (3’6″ gauge). 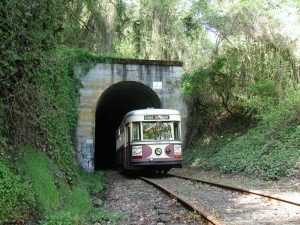 It was typically operated on the Broadway line in Portland, thus was nicknamed a “Broadway car”. It was one of 15 Brill Master units bought by Portland Traction Company. It was a very modern car for its time with safety and one man operation in mind. 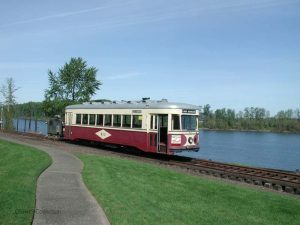 When streetcar service ended in 1949-50, this car was transferred to the Interurban line between Portland and Oregon City. It had to be re-gauged to the Interurban’s standard gauge tracks. Entirely new trucks were used in the conversion. The car then received the new number of 4012.